A vivacious collection of art and design pieces depicting popular culture from 1885 to 1945, the Wolfsonian is the amalgamation of a long-term pursuit by eccentric heir and collector, Mitchell Wolfson Jr. Housed in the original warehouse used as a storage facility for the 70,000 pieces, visitors can pick through the origins of graphic and industrial design from the distinctive propaganda art from Germany, Italy, and the United States, and the remarkable industrial design pieces from modern German design to Bauhaus. 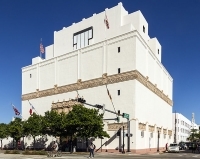 A haven for lovers of design, the Wolfsonian is full of artistic treasures. Not to be missed is the eccentric Dynamo café and museum shop. Opening times: Monday, Tuesday, Thursday, and Saturday 10am-6pm; Fridays 10am-9pm; Sunday 12pm-6pm. Closed Wednesdays. Admission: $7 adults, $5 seniors, students and children.